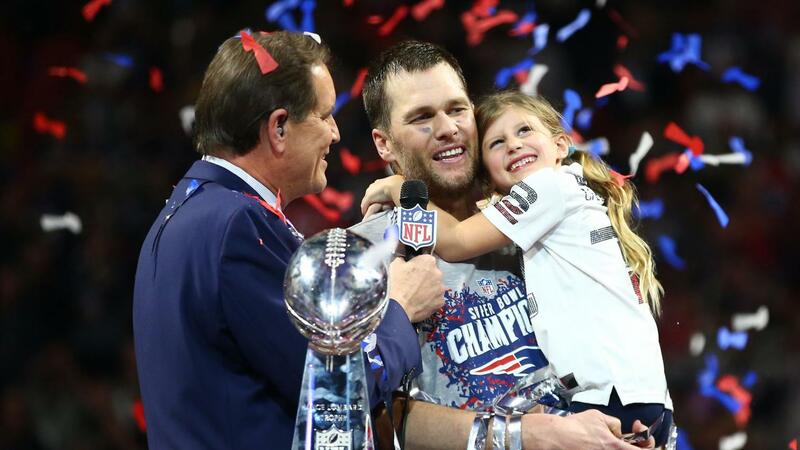 Quarterback Tom Brady celebrates his 6th Super Bowl win with his family. On Sunday, Feb. 3, the Patriots set the record for the most Super Bowl wins in history, scoring only one touchdown in the lowest scoring game ever. 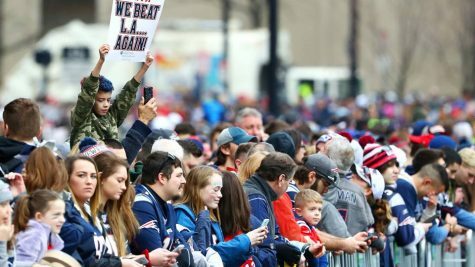 On Sunday, Feb. 3, people from across the country gathered around their TV at home, attended watch parties or went to the Mercedes-Benz Stadium itself in Atlanta, Georgia to watch Super Bowl LIII. This year, the New England Patriots faced the Los Angeles Rams in a defensive battle. In the end, the Patriots surpassed the Rams by a touchdown and field goal, leaving the score at 13-3. The Patriots won their sixth championship in the lowest scoring Super Bowl ever. Along with this, there were many other records set like the longest punt and oldest coach to win the Super Bowl. A few minutes into the game, Patriots quarterback Tom Brady threw an interception, stifling the Patriots drive and relinquishing possession to the Rams. After this, both teams performed similarly until reaching the end of the quarter when the Patriots attempted a field goal that would have given them a 3-0 lead. The punter missed the goal, however, leaving the quarter scoreless. The second quarter was similarly void of offense, although the Patriots were able to muster a field goal, giving their fans something to get excited about. Later, Rams punter Johnny Hecker broke the record for the longest punt when he kicked the ball 65 yards. The game, however, continued to be comprised of defense and very little offense. Patriots fans celebrate after landing yet another Super Bowl win. As the second half came to an end, fans prepared for the anticipated halftime show. Maroon 5 started their performance by singing songs such as “This Love,” “Sugar” and one of their most recent hits, “Girls like you.” Travis Scott then made an entrance on an animated asteroid rapping the well-known song “Sicko Mode” along with an appearance by SpongeBob SquarePants. Another appearance was made by Atlanta rapper, Big Boi. Entering the fourth quarter, the score was tied when the Rams evened the score with a field goal of their own. The deadlock was finally broken when rookie Patriots running back Sony Michel bolted into the end zone to give them a lead in the last seven minutes of the game. This would be the only touchdown, giving Patriots the win for Super Bowl LIII. “As a Rams fan, it’s obviously disappointing for me that they lost. However, it was also disappointing to watch this low-scoring game. Offense on both sides did not play that well,” freshman Mia Calderon said. Altogether, despite the underwhelming performance from both teams, Patriots secured another Super Bowl ring, adding to the legacies of some of their all-time greats.